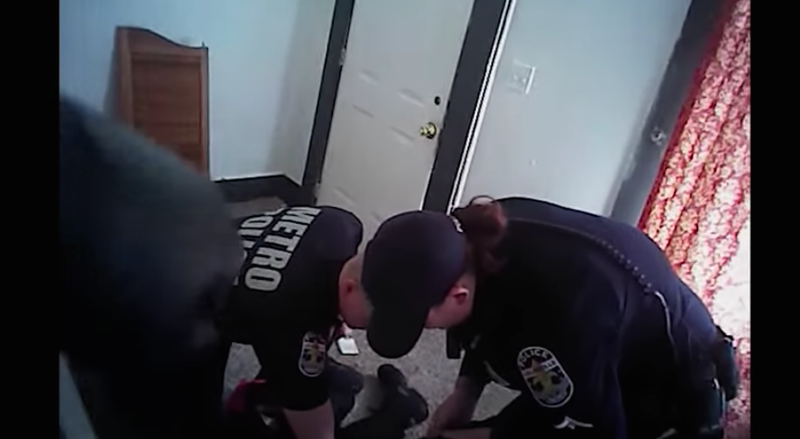 The Louisville (Ky.) Metro Police Department has released body-camera video showing the shooting of an unarmed black man that occurred almost immediately after an officer shouted at him to put his hands up. According to the Courier-Journal, Police Chief Steve Conrad said that he was reserving judgement until the completion of an internal investigation after the video was released Thursday. The victim, 38-year-old Bruce Warrick, is currently in the hospital in critical condition after being shot in the stomach. The incident unfolded Wednesday morning as three officers searched an abandoned house after receiving reports about a man using drugs outside the residence before going inside. In the video, officers are seen shouting as they walk around inside the house, identifying themselves multiple times and asking anyone there to come out with their hands up. Eventually, Officer Sarah Stumler approaches a box spring leaning against the wall. Peeking behind the box spring, she sees Warrick hiding. Stumler shouts, “Show your hands,” before almost immediately discharging her weapon. Stumler, who has been with the department for about eight years, has been placed on administrative leave and her police powers suspended, pending an investigation. The Commonwealth of Kentucky Attorney’s Office will determine whether further investigation is needed or if criminal charges will be filed, while an internal Professional Standards Unit investigation will determine if any departmental polices were violated. Officers Branden Lammers and Aaron Seneker were also in the house with Stumler at the time of the shooting but did not fire their weapons. Louisville Mayor Greg Fischer also issued a statement after the shooting, asking for patience throughout the investigation.